This ARTHOUSE collaboration features a distinctly seaside theme, each drawing carrying the unique style of their creator. 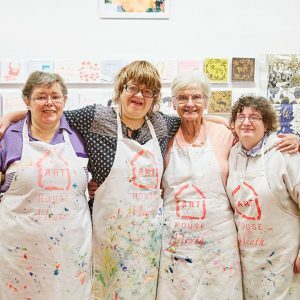 Our luxury wrapping papers are created by professional designers on-site, producing beautiful layouts from the unique creations of ARTHOUSE artists living severe epilepsy, physical and learning difficulties. The designs are then printed on high quality paper to produce gorgeous wrapping paper bursting with character.